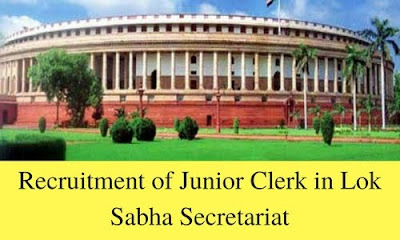 Online applications are invited from eligible Indian citizens for filling up 31 vacancies (01 SC, 05 ST, 09 OBC and 16 UR) (26 in English stream and 05 in Hindi/bilingual stream) for the post of Junior Clerk on Direct Recruitment basis in Lok Sabha Secretariat which is a level 4 post in the Pay Matrix (Provisional) [in the Pay Band of Rs. 5200-20200 (PB-1) +Grade Pay: Rs. 2400 (pre-revised)]. The online application can be filled up from 10.07.2017 to 09.08.2017 till 05:00 p.m. after which the link will be disabled.